Heat the olive oil in a medium saucepan. Finely chop or grate the onion (I find chopping easier, but some people can actually grate onions without ending up with onion juice all over the kitchen, and I say more power to them), and sauté briefly with the chilli flakes and seasoning to soften while you peel and grate the carrot (use the coarser grater setting). Add the carrot to the pan, reduce the heat and cover, so that it cooks slowly. 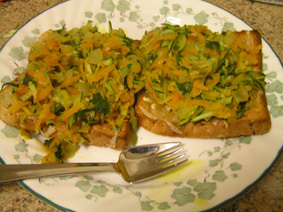 Grate the zucchini and add to the pan once the carrots are soft. Start the bread toasting. I do this under the grill. Grate the gruyère, and chop the basil. By now, the zucchini should be nice and soft too. Add the basil and stir around. Season a bit more if you like. You can take it off the heat at this point. Divide the cheese between the slices of toast, and pop back under the grill until it melts. Pile the carrot mixture on top of the bread and melted cheese, and serve. I am way too tired for variations. Assuming a reasonable source of gluten-free bread, this is already pretty much fine for anyone except the dairy-avoidant, and it’s difficult to know how to replace the gruyère, really. I mean, melted cheese is pretty much the reason I am never likely to become vegan. 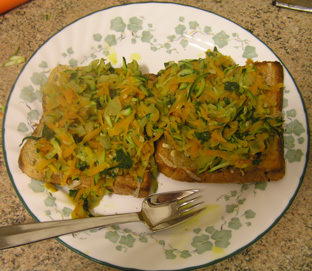 I think if I were trying to do a vegan version of this, I’d try topping the toast either with a garlicky cannelini bean purée or with something like the Ancient Roman Herb and Pine Nut puree (tofu variation), and then putting the veggies on top. Both of these alternatives add a creamy texture and a bit of protein as well as flavour, so they might do. Or do as Johanna has done and make cashew goats’ cheese to spread on top. They aren’t the same as gruyère, though. I love the simplicity of this – as for a vegan version my thoughts are the I might do some nut butter plus a sprinkle of nutritional yeast flakes and a sprinkle of smoked paprika. I am a huge fan of melted cheese but I think the vegies would make this a bit less needy of the meltiness. I sometimes think I could live without cheese if I can just keep the nuts in my life! I hadn’t thought of nut butter (probably because I detest peanuts in all forms), but that does sound like a good idea. And yes, my work is a fun place, largely because my colleagues are such lovely people.